Attarat Power Company In partnership with local and international partners, Enefit is currently in the process of establishing two parallel oil shale projects in Jordan; an oil shale fired power plant and a shale oil production plant. Enefit's oil shale fired power plant will be located in Attarat um Ghudran deposit in central Jordan. The plant will have two circulating fluidised bed (CFB) units, each with a gross capacity of around 277MW, generating 554MW.The plant will consume approximately 10 million tonnes of oil shale per year. When completed in 2020, it will be one of the largest power plants in Jordan and the largest oil shale fired power plant in the world after Enefit's Power Plant in Estonia. APCO will use new generation circulating fluidised bed (CFB) technology in Jordan, which has a significantly lower environmental impact than previous technologies, with reduced air emissions and increased efficiency. 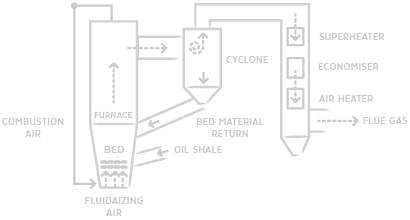 In CFB boilers, the crushed oil shale is burned in a stream of air directed into the combustion chamber from below, creating a so-called fluidised bed. The combustion heat is used to produce steam from water. The steam is then directed into a turbine, where the kinetic energy of the steam rotates a turbine generator that produces electrical energy.